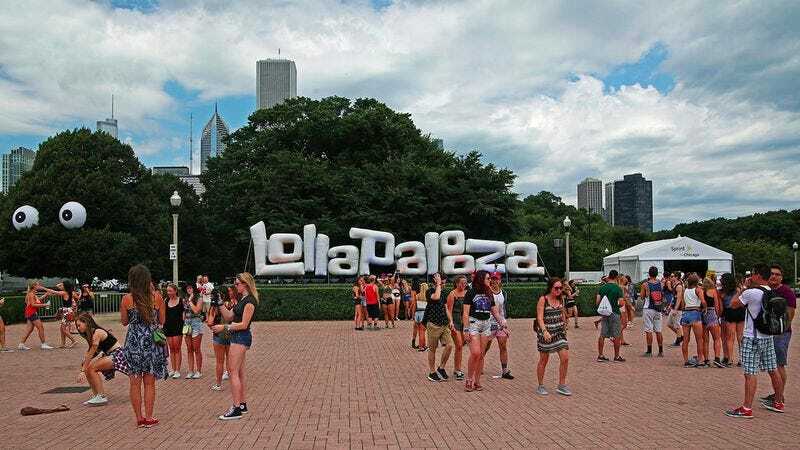 It never rained on Lollapalooza, but that didn’t stop the fest’s organizers, C3, from both evacuating the whole fest Sunday afternoon under threat of thunderstorms and then, later that night, shutting down the festival’s closers 30 minutes early. That kind of rainy speculation put a damper on the annual event, which brings about 300,000 spectators to Chicago’s Grant Park every August. All that being said, tens of thousands of scantily clad teens still seemed to have a great time, roaming the grounds in drunken packs and getting down to everything from A$AP Rocky to Paul McCartney. And, as always, The A.V. Club was there, covering the whole damn thing. Below are some of our picks for the best, worst, and most whatever moments of the three-day musical slog. 1. Play dress-up with a bunch of random “rock star” accouterments like cobbled together from a high-school drama department props room. 2. Watch graffiti artists create images in a diorama-like enclave. 3. Get my hair styled. 4. Get a temporary tattoo.